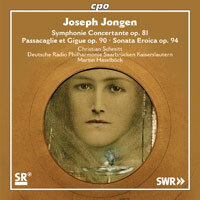 JOSEPH JONGEN (1873-1953): Passacaglie et Gigue for Orchestra, Op. 90, Symphonie Concertante for Organ and Orchestra, Op. 81, Sonata eroica for Organ, Op. 91. Description: Two of Jongen’s most-recorded works unfortunately appear yet again but there is also the 17-minute Passacaglie et Gigue which is not otherwise available. So, if you’re a Jongen collector, you’ll want this stately Passacaglie of burnished, golden tone and its playful Gigue which starts out as if it’s going to be a military march and then becomes a cross between a high-country folk dance and a tarantella. Christian Schmitt (organ), Deutsche Radio Philharmonie Saarbrücken Kaiserslautern; Martin Haselböck.